Tyumen, the first Russian city in Siberia, finds a way to preserve its heritage even as it becomes known for its natural resources. Founded in 1586 on the site of an earlier Tatar settlement at the confluence of the Tura and Tyumenka Rivers, Tyumen was the first Russian town in Siberia. The area had been conquered by the Cossack leader Yermak only a few years before as the beginning step of an epochal Russian move across the Ural Mountains into the enormous north Asian land mass. Although its rivers were only tributaries of the Irtysh (itself a tributary of the great Ob River), Tyumen was well situated to utilize Siberia’s vast water network. Like most early Russian towns in Siberia, Tyumen originally served as a fortified settlement for Cossacks and other troops, who in the 17th century protected newly developing trade routes, particularly with China. When the southern boundary of Moscow’s Asian territory became more settled during the 18th century, Tyumen’s importance increased for the development of transportation as well as small commercial and industrial enterprises. On a more lugubrious note, Tyumen’s status as a transportation nexus involved it in the notorious exile system, which sent thousands of convicts and political exiles throughout the distant reaches of Siberia. 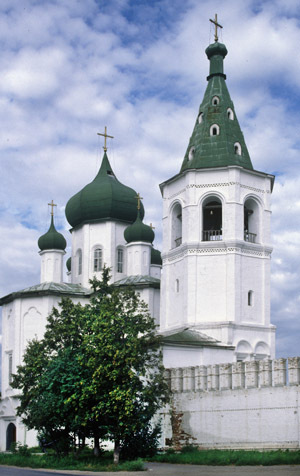 As a regional administrative point for western Siberia, Tyumen also became a center of the Russian Orthodox Church. The city’s Trinity Monastery, founded in 1616 on the high right bank of the Tura River and originally dedicated to the Transfiguration, was a modest collection of log buildings until its transformation in the early part of the 18th century by an energetic Ukrainian prelate, Bishop Fedor Leshchinskii. An ally of Peter the Great, Bishop Fedor saw architecture as a reflection of a broad cultural transformation, and the Church of the Trinity that he built at the monastery in 1709-1715 is Tyumen’s earliest surviving building. Gutted during the Soviet era, the Trinity Church is now being restored, as is its neighbor, the Church of Saints Peter and Paul (1741-55). These early examples of a provincial baroque style with Ukrainian features served as a model for other 18th-century churches in Tyumen, culminating with the lavish Cathedral of the Icon of the Sign (Znamenskii), which has recently been splendidly refurbished. Built in several phases between 1768 and 1891, the cathedral displays the florid decoration typical of much of Siberian church architecture. The daunting vastness of Siberia’s reaches gradually submitted in the 19th century to new forms of transportation. The first steamboat to ply a Siberian river was constructed here in 1838. The greatest impulse for economic growth came with the completion of a railroad from Yekaterinburg, on the east slope of the Ural Mountains. This line ultimately became an important segment of the trans-Siberian railroad, transporting the wealth of Siberia’s forests, mines and new grain farms, as well as leather and other products of local factories. Furthermore, at the turn of the 20th century over half a million settlers passed through the town en route to Siberia’s open agricultural lands. During World War II, Tyumen served as a major evacuation point for industry and education, as well as for refugees and wounded soldiers from the front lines in the western part of the Soviet Union. Even Lenin’s body was evacuated here from its place in the Mausoleum on Red Square. Tyumen today is the capital of an enormous province—stretching from Kazkhstan in Central Asia north to the Arctic Ocean—that is one of the richest energy producing regions in the world. The discovery of huge oil and gas reserves in this area almost half a century ago has had a fundamental impact on the world’s energy resources. Tyumen is at present one of the few Siberian cities to show major population growth: from slightly over half a million in the 2002 census to some 600,000 in the latest estimate. Although the distribution of wealth from natural resources has been uneven (to say the least), Tyumen has obviously benefited from this bounty. A walk through the historic center of town shows vivid contrasts of modest pre-revolutionary brick and wooden buildings, rarely more than two stories in height, with ponderous Soviet buildings and sleek new commercial centers. Some of the new structures are private apartment buildings of impressive quality; others are banks; and still others a part of the expanding Tyumen State University. As is typical in Siberian towns, most residents live beyond the historic center in standard housing developments of the Soviet period. Fortunately, many remnants of Tyumen’s past are being preserved. This is especially evident in the city’s historic wooden houses, with elaborate framed and carved window surrounds in a style that is specific to Tyumen. Many Siberian cities, such as Tomsk and Novosibirsk, have their own styles of wooden houses with decorative windows, but Tyumen is unique in the massive quality of the window construction, which often includes carved panels below the sill as an additional decorative and protective device. Their solid construction allows rows of large windows in wooden houses even in this harsh climate, thus bringing maximum available light to interiors during the long Siberian winters. With so much wealth Tyumen, could have turned its back on its historic legacy, as many other cities have done. The fact that much of Tyumen takes pride in its remarkable wooden houses is a positive signal for the health of its community spirit. And if it can happen here, it should happen elsewhere in Russia.